An amazing treatment throughout the all process. We love to watch the photos of our album!” Marta and Jorge. 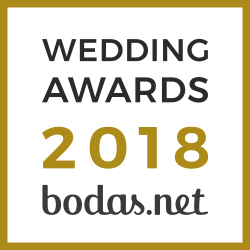 “The personal assistant service for the wedding made the difference: they helped us to solve the small doubts that came up during the day and we were able to relax and enjoy our party” Andrés y Elena. “All our relatives were surprised when they saw the images taken by the dron. It is something really spectacular” Carolina and Marcos. “I would recommend everyone is getting married, they make you feel very comfortable with a unique style” Daniel and Laura. “I will never forget how well they made me feel throughout my wedding day. Thank you Audiovisuart team! “Nicolás y María. “We were delighted to have Audiovisuart during the most important day of our life. The photos they took are spectacular. The team is very professional and attentive. They are always ready to face any problems or doubt that comes up. We are happy to have following our instinct to visit your stand at the Fira Nuvis in Sabadell.